You've been waiting for it, and now it's here! 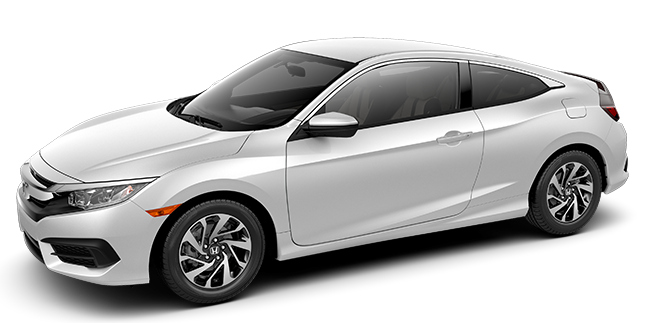 The all- Honda Civic Coupe has arrived and it's available now at Honda of Murfreesboro. This exciting new two-door Civic model has long been hailed as one of the sportiest cars on the market, and its affordable price and fun-filled powertrains make it a top pick for drivers all over TN. Come explore the all- Honda Civic Coupe at Honda of Murfreesboro. We are located in Murfreesboro at 1625 South Church Street and proudly serve drivers and car shoppers from all over Nashville, Shelbyville, and Franklin and the surrounding areas. The new Civic Coupe has arrived, and you won't want to miss it! The impressive new Honda Civic Coupe has been completely redesigned from the ground up for the 2016 model year, and it shows. The front fascia is bolder and more aggressive, as is the stance thanks to an all-new frame and longer wheelbase. The rear fascia stands out with an exclusive rear tail light design with distinctive C-shaped brake lights that arch over the entire rear deck lid for a futuristic look. A power moonroof is standard for all trims but the base model and rain-sensing wiper blades now come standard on the Touring model. Several new eye-catching wheel designs are available, all of them struck in aluminum alloy and ranging from 16" to 17". New colors like Energy Green Pearl and Aegean Blue Metallic make this new Civic Coupe a stand-out star on any road. Honda pulled out all the stops when designing the new Civic Coupe, so you can be sure you will find capable new powertrains to match. The standard engine is a 2.0-liter inline four-cylinder engine that makes 158 horsepower and 138 pound-feet of torque. In the higher trims, starting with the EX-T, you will find a 1.5-liter turbocharged inline four-cylinder engine that produces 174 horsepower and 162 pound-feet of torque. The 2.0-liter I4 has a multi-point fuel injection system and the turbo 1.5-liter I4 has direct injection. Both engines come with an Eco Assist System, Hill Start Assist, and a drive by wire throttle system. The standard transmission is a six-speed manual (standard on the Civic Coupe LX); a continuously variable transmission is standard in the other trims. When properly equipped, the 2016 Civic Coupe can earn up to 31 mpg city and 41 mpg highway, or 35 mpg for combined city/highway driving. The all- Civic Coupe comes in five amazing models including the LX, LX-P, EX-T, EX-L, and Touring. In the LX you will find the 2.0-liter I4 engine and six-speed manual transmission (an M-CVT is available as an option). The LX-P trim comes with the same engine as the LX but this model features the M-CVT gearbox as standard and can return 30 city/41 highway mpg. In the EX-T, EX-L, and Touring trims, Honda has included an upgraded LL-CVT transmission that gets the big mpg numbers, 31 city and 41 highway. Standard features across the Civic Coupe lineup include full power accessories (windows, locks, side mirrors), automatic climate control, Bluetooth, a rearview camera, an electronic parking break, a USB port, a 5" audio display screen, and a 160-watt AM/FM stereo. Additional features in higher trims include an upgraded 7.0" touchscreen display, dual-zone automatic climate control, a second USB port in the center console, Apple CarPlay and Android Audio integration (EX-T and above), and a 450-watt premium stereo with 10 speakers and a subwoofer (EX-T and above). The top-level Civic Coupe Touring includes goodies like Honda's satellite-linked navigation system with voice recognition, Honda HD Digital Traffic, and Song By Voice; leather upholstery, heated front seats, LED turn signals, chrome door handles, LED headlamps with auto on/off function for low and high beams, heated power side mirrors with integrated turn signals, and rain-sensing variable intermittent wiper blades. Venture to our Murfreesboro Honda dealership to explore the all- Honda Civic Coupe. This thrilling icon of the roads has been one of America's one of the most popular cars for decades, and this newest model is sure to sweep you off your feet the moment you sit behind the wheel. Head to Honda of Murfreesboro from anywhere in Nashville, Shelbyville, and Franklin. We are conveniently located at 1625 South Church Street and look forward to serving you today! *26 city/38 highway/31 combined mpg rating for LX model with 6-speed manual transmission. 30 city/41 highway/34 combined mpg rating for LX & LX-P CVT models. 31 city/41 highway/35 combined mpg rating for EX-T, EX-L and Touring CVT models. Based on 2016 EPA mileage ratings. Use for comparison purposes only. Your mileage will vary depending on how you drive and maintain your vehicle, driving conditions and other factors.